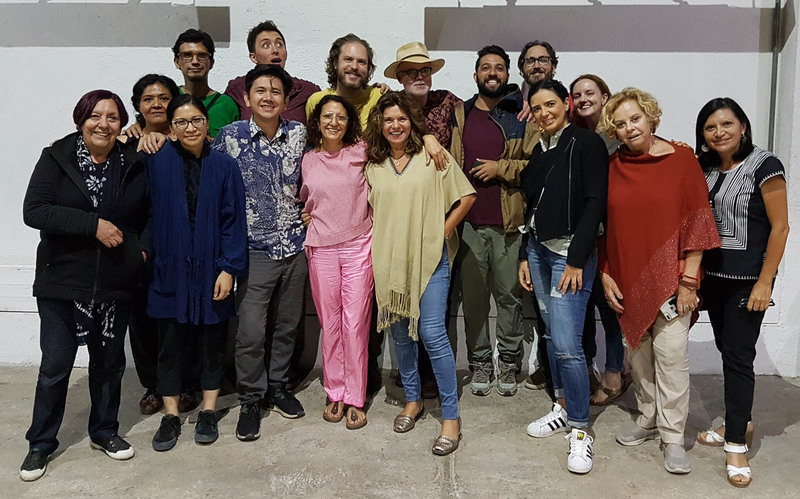 Participants in Garland’s event in Oaxaca after being garlanded at the studio of Aden Paredes. 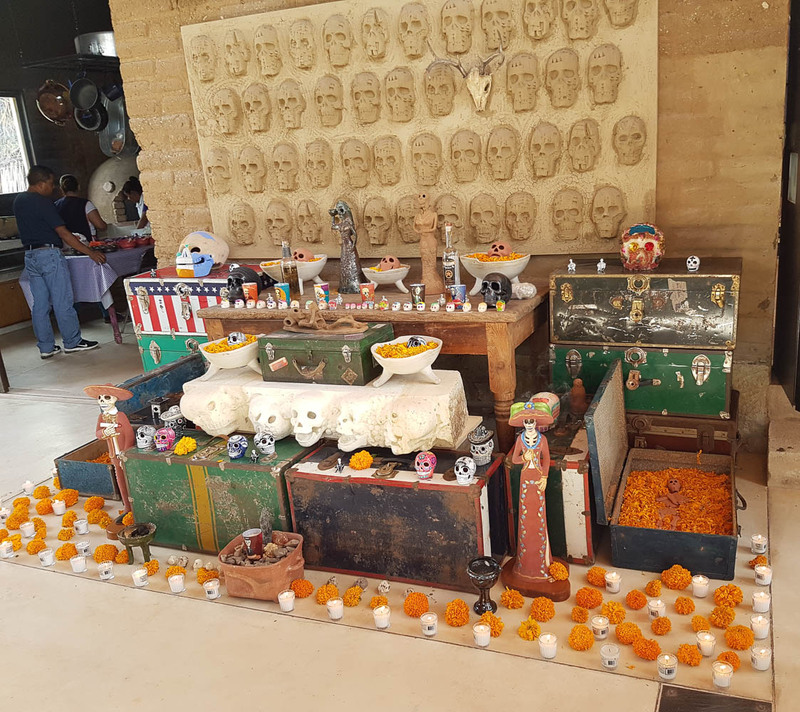 The ofrenda of Aden Paredes in memory of those who lost their lives in migration, featuring a clay skeleton in a suitcase filled with marigold. 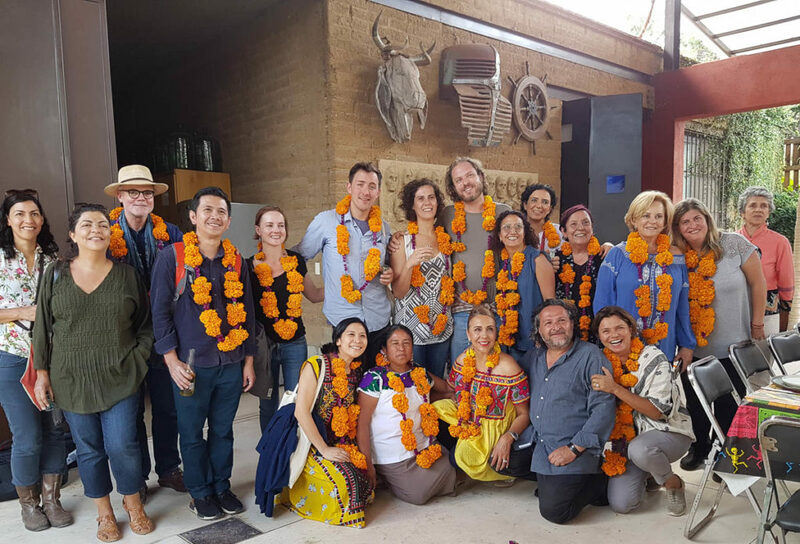 Elated after the final roundtable at La Calera. 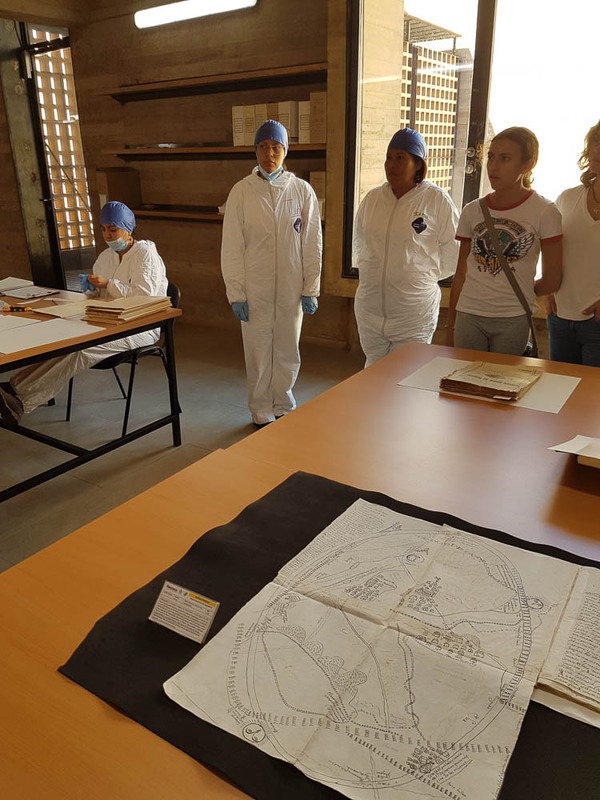 The newly opened Oaxaca Archives has started the epic task of preserving the mountain of documents telling the story of the states colonisation. 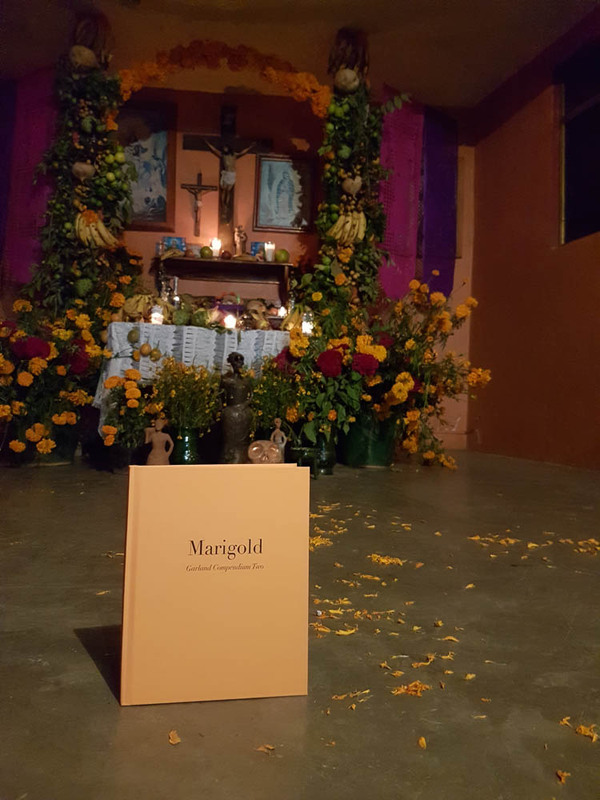 We launched #12 of Garland in Oaxaca with a program of talks, demonstrations and tours organised by our Mexican editor Valeria Florescano. This was a chance for us to learn more about the Zapotec values that underlined their mesmerising crafts, and particularly its place in the world today. “Where is its soul?” Rufina asked. 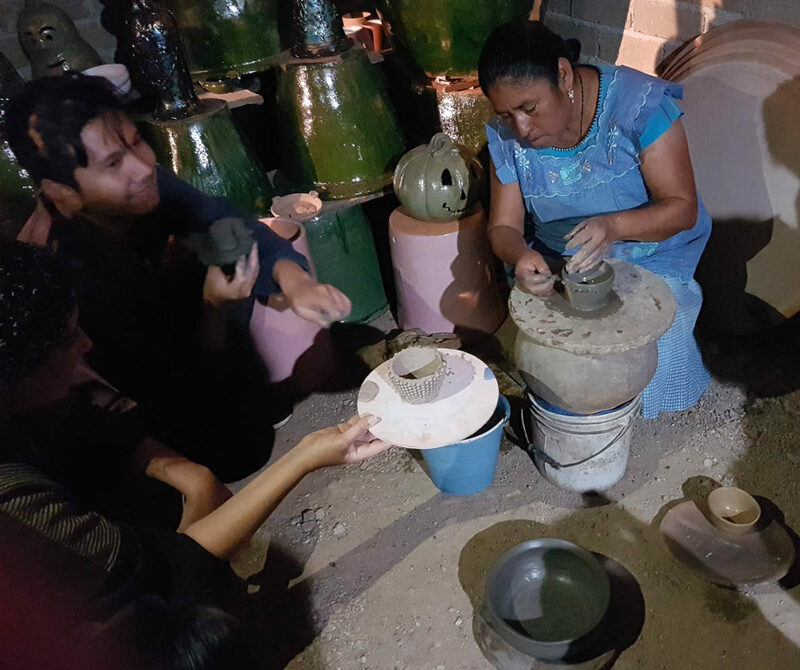 A group of craftspersons from the US were introducing 3D clay printing technology to one of Oaxaca’s most successful ceramicists, Rufina Ruiz Lopez of the legendary village, Atzompa. 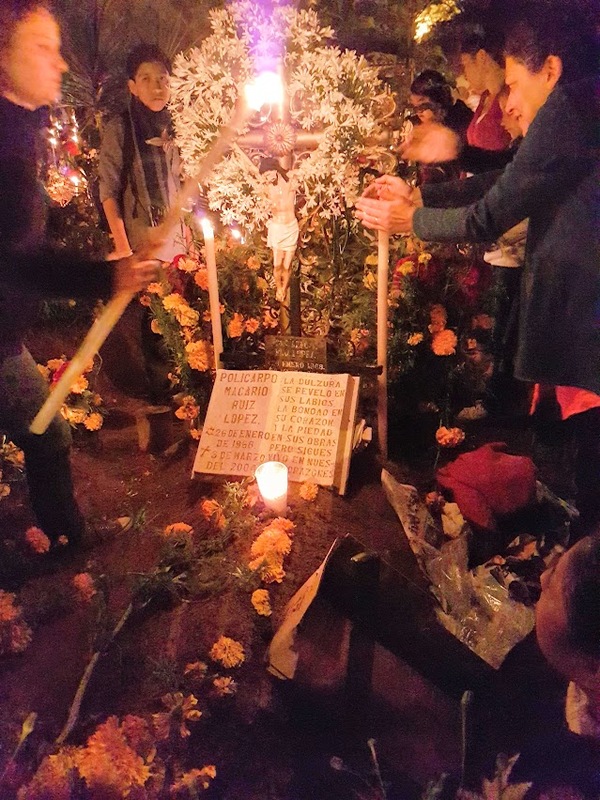 It also to be the first night of El día de los Muertos, when Rufina would invite us to accompany her to the cemetery for the lighting of the candles around her twin brother’s grave. Phirak Suon and Brandon Callaghan had developed a unique collaboration of clay and glass that involved 3D printing ceramic casts for creating unusual geometric glass forms. As we began to realise, many Zapotecs in Oaxaca are keen to embrace technology as a way of growing their culture. We first watched Rufina demonstrate her technique throwing on a rickety assemblage of an upturned clay pot, broken tile and wooden square. Despite its fragile appearance, she was clearly very comfortable with the arrangement after a lifetime of throwing and created a pot for us with amazing dexterity. She looked to Phirak and Brandon and asked for a challenge from them: “What do you want me to 3D print?” Phirak gave her one of the woven clay forms that was inspired by textiles in Angkor Wat. She proceeded to quickly reproduce the digital with her deft hands. Then it was Phirak’s turn to demonstrated his process on a much loved 3D printer, which looked like one of those old overhead projectors. The first attempt was a failure, due to some issue with the extrusion of the clay. 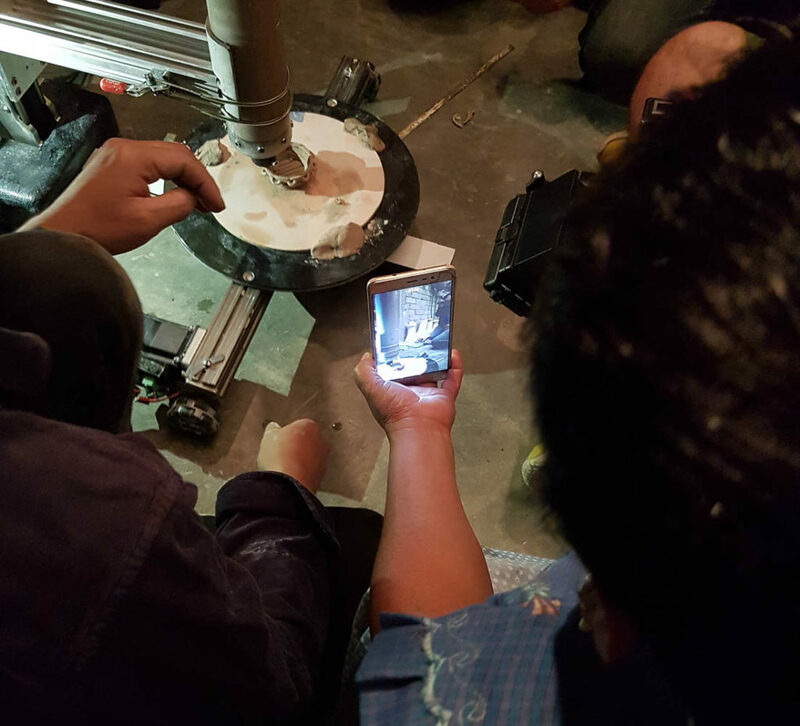 But the second went well, and Rufina was keenly studying the process, filming it on her smartphone. This wasn’t Rufina’s first encounter with the latest technology. 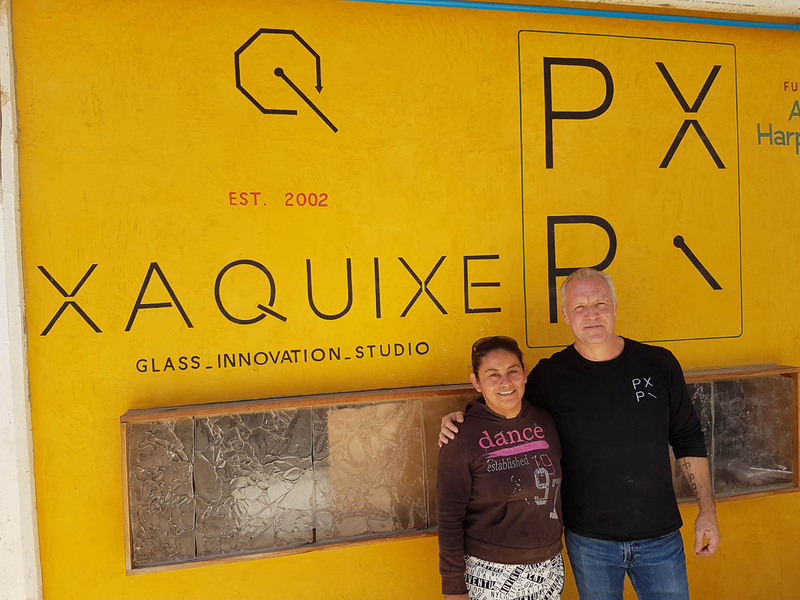 Earlier that day we had visited the impressive organisation Xaquixe, which was making energy from the detritus of mezcal brewing to power kilns for blowing glass. They had produced a special kiln for Rufina to trial which is now in her workshop. 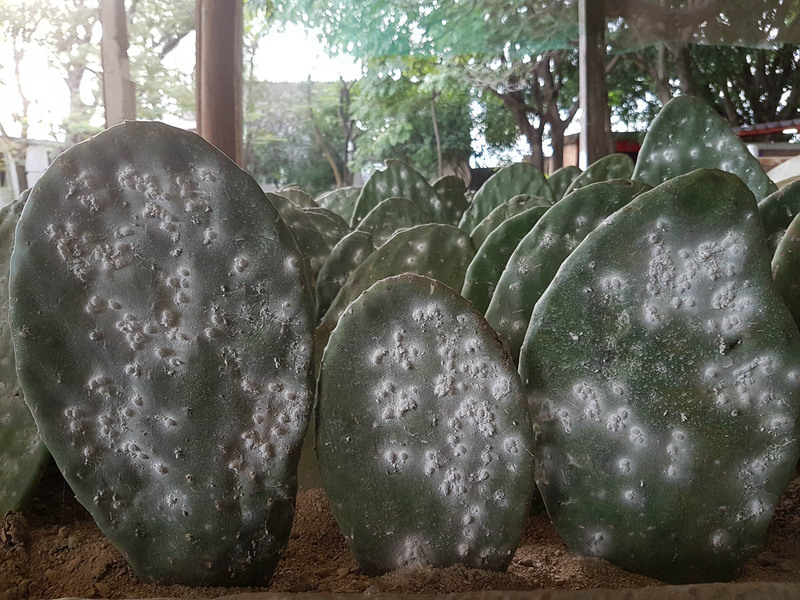 Through our tour of Oaxaca, the word “Zapotechnology” came to mind as a way of using innovation to further traditional values, rather than simply profit. This relates to the Zapotec concept of guendalisaà, “crafting kinship”. When I asked Rufina what her aim was, she said it was to keep this craft alive for her family. Zapotechnology reflects a strong connection between the ancient and modern worlds. 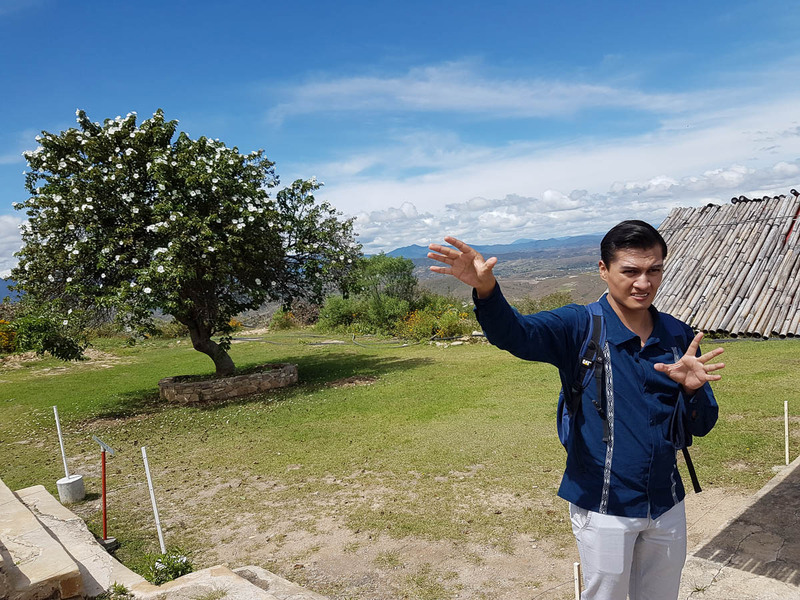 On a tour of the ruins of Atzompa by the head of the archeology department, we learnt that it was traditional potters who uncovered and recognised the ancient kilns used by Zapotec ancestors. I saw an echo of this later when visiting the studio of Venus y Loco, a creative pair of makers (Gisela Morales y Emilio Cervantes) that produce beautifully designed objects that extend traditional Zapotec forms. Along with mezcal, chocolate is a key ingredient in Oaxaca life. It is usually drunk with water and frothed with a wooden implement called a molinia. Venus y Loco had worked with engineers in UNAM university to develop a form to enhance the motion, which they cast in ceramic and metal. It is tastefully packaged in local weaving and sold to local cafes. The most successful business model for this was Gorilla Glass (they used the name before Corning developed it for smartphones), which has established itself as the world’s leading producer of glass piercing jewellery. After seven years in development, it now employs 35 workers in a family-friendly business. 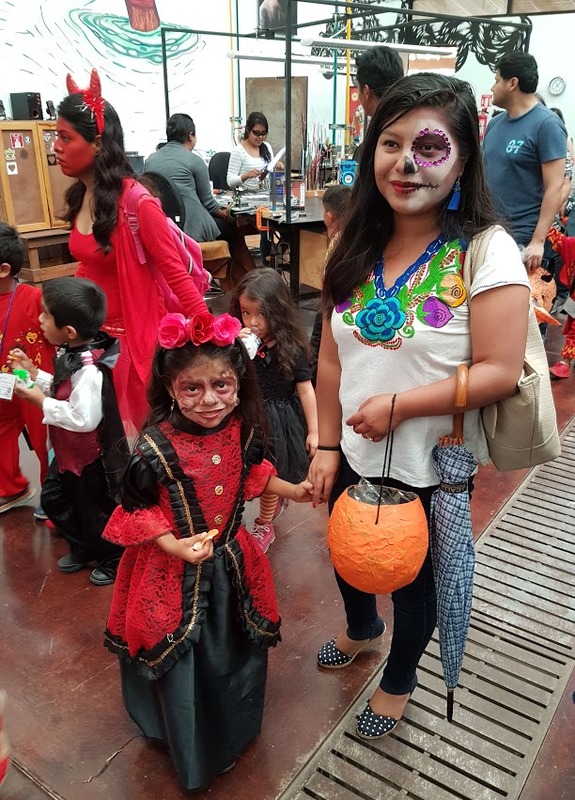 While we were being shown their gleaming facilities, parents and children dressed for El Dia de Los Muertos paraded surreally through the workshop. 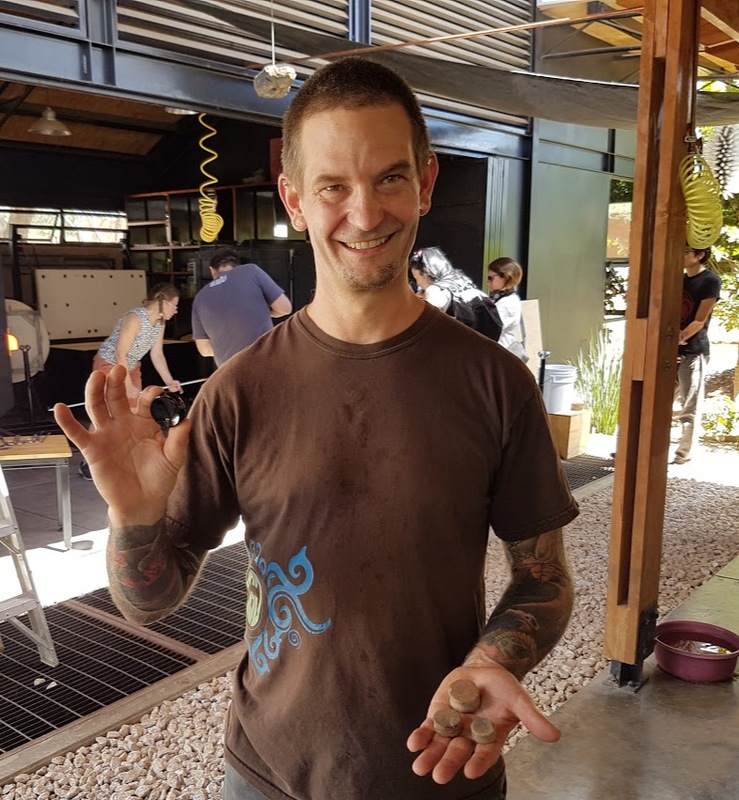 The founder Jason Pfohl proudly showed me a recent acquisition of Zapotec obsidian earplugs, his own glass versions gleaning either side of his face. Pfohl is one of a number of United Statesians working productively in Oaxaca. They have the advantage of coming from outside the community and having access to capital. Locals offer not only good manual skills but also a sense of collective responsibility that provides an ethical context. It’s a welcome positive perspective on US entrepreneurship that counters the more belligerent voices on the other side of the border. 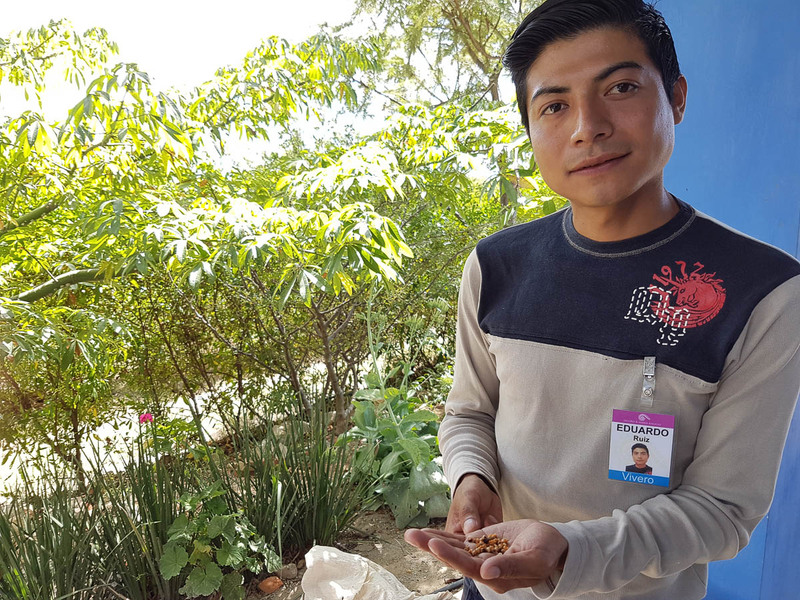 Eduardo Ruiz holding the seeds for the stock of copal trees being planted to supply alebrije makers in twenty years time. 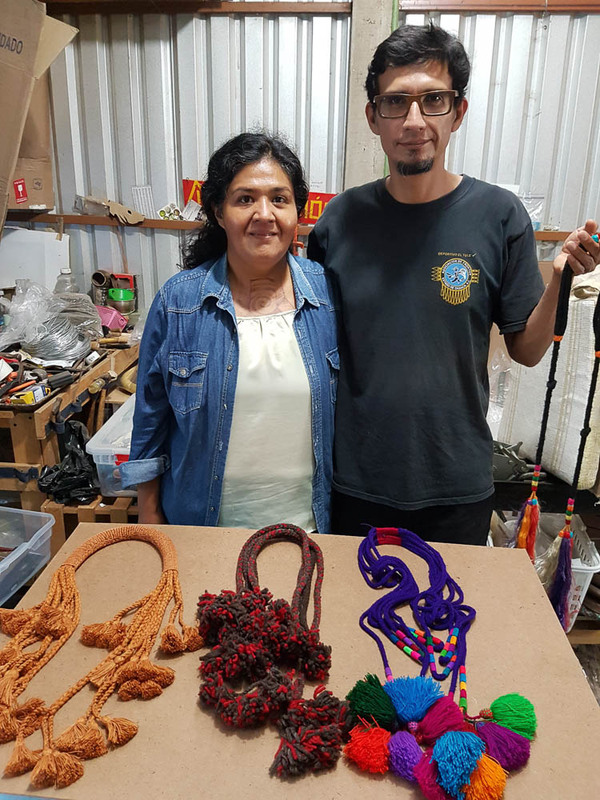 The benefits to business from US attention is particularly evident in the alebrije workshop of Jacobo & Maria Angeles in the village of San Martin Tilcajete. 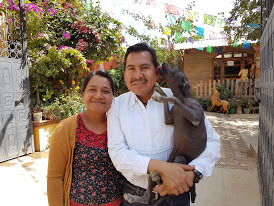 Much of Coco the film takes its inspiration from their workshop, including the creatures of the underworld, Dante the hairless dog (Xoloisquitli) and the grandmother who is modelled on their cook (and subject to many selfies from visitors). With this attention, the Angeles couple have built a well-functioning empire that marries good business with Zapotec values. They have researched the ancient science of natural dyes to make their paints. And they have established a plantation of copal trees to supply future generations with wood to make these figures. The first trees will come online in 20 years time. Having a depth of tradition offers a future vision that is otherwise lacking in much capitalism from the US. Carlomagno Pedro Martinez with tableau in honour of this recently departed pet dog. I was particularly impressed with the work of ceramicist Carlomagno Pedro from San Bartolo Coyotepec. His black clay forms offered quite a stark contrast to the psychedelic alebrijes. Carlomagno showed us a moving tableau in honour of his recently deceased pet dog, surrounded by figures from the afterlife. He explained that the dog was his tono, or animal spirit, and when it died suddenly he interpreted this as a sacrifice saving himself from a death event. 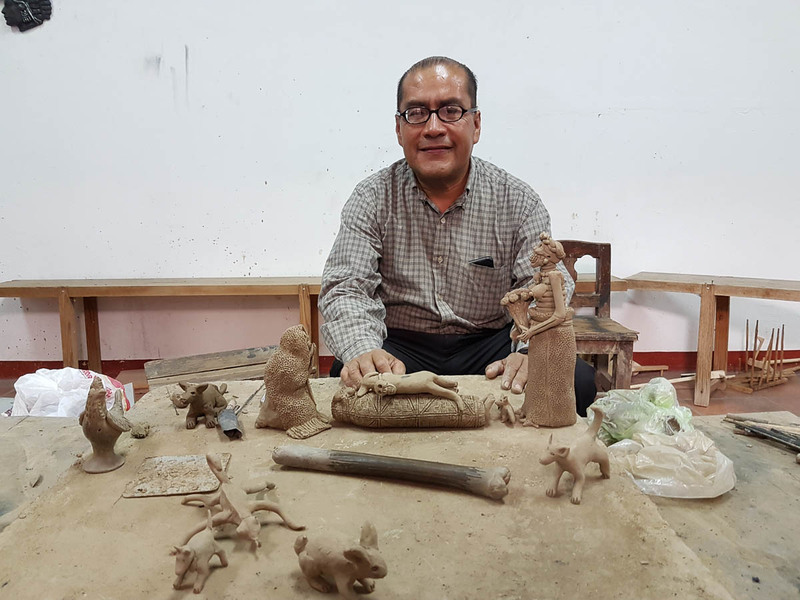 This interweaving of Zapotec mythology with everyday life seems to have great potential for diversifying Oaxaca crafts and combating the danger of commodification. For tourists from major metropolitan cities, Oaxaca offers a precious glimpse of an organic life as lived in villages they left many generations back. There is the natural fear that this world might be contaminated by technologies that remove the human element. But our brief engagement with craft workshops in Oaxaca revealed a strength of culture that could absorb the new in a way that enabled it to grow stronger. That certainly is the hope, and we welcome our new Zapotec friends to the ongoing conversation about the value of what we make. In Australia, we are also blessed with a “ancient” cultures, but the divide between Indigenous and Settler is greater than in Mexico. And we have never attempted a revolution to forge a unified national story. But like Oaxaca, we value partnerships of mutual benefit, as reflected in some Garland stories. Technology in the West is celebrated as a more efficient means. It makes things happen faster, more reliably and over a greater distance. But it has also radically reduced our time frame and does not speak to our ultimate goals. The strength of Zapotec culture in Oaxaca demonstrates the kind of bigger picture we need to track our progress by a more meaningful measure. The concept of guendalisaà, crafting kinship, seems the value that underlies more activity in the world. So what is the value that guides what we make in the world? Congratulations to Valeria Florescano for pulling off such an epic meeting of craft cultures. Thanks to everyone who welcomed us so warming, especially during such an intense period as El Día de los Muertos. A special agradaciemento to Jesus Torres for providing La Calera as a wonderful base.